Finding information about CHARGE syndrome can be a daunting task. You might be looking for something specific (medical information, for example) and don’t know where to start. OR you Google it and so much comes up that you don’t know how to sift through it. Parents, family members, professionals from all specialty areas come to our website to be better informed. Our goal is to make sure we can provide that information in an organized and helpful way. Therefore, we have searched the world and our own archives to bring you information about CHARGE syndrome. We hope that this page gives you a good start and guides you to what you are looking for. We invite you to suggest other resources for inclusion here so that others can learn from your experience. In response to the most common requests for information from educators and therapists, this packet was developed as a supplement to the Management Manual for Parents. The packet may be downloaded in sections or in full. A packet of information in a folder designed to help parents of a new baby (or newly diagnosed child) understand what CHARGE syndrome is, frequently asked questions, what to do now, information about the CHARGE Syndrome Foundation, and listing of some helpful resources. 10 pp. The December, 2017 issue of this journal was dedicated to updates on CHARGE syndrome – everything from CHD7 DNA information and genetic counseling to medical issues to behavior. To see summaries of all of the papers (and links to the papers themselves), go HERE. The March, 2005 issue of this journal was dedicated to CHARGE syndrome, with the papers coming from the symposium on Behavior in CHARGE presented at the 2003 International CHARGE Syndrome Conference in Cleveland. You can find those articles HERE. essential. This checklist was developed by Carrie Lee Trider, Angela Arra-Robar, Kim Blake, and Conny van Ravenswaiij. It is organized by body system and age to guide the healthcare provider in their approach to care. The checklist was evaluated using a modified Delphi method to develop a final consensus. The goal of the checklist is that the recommendations will promote improvements in care by preventing missed diagnoses, allowing for anticipatory counseling, and facilitating early referral for interventions and treatments. 28 in-depth fact sheets about the many aspects of living with CHARGE syndrome, designed for professionals but useful for families as well. 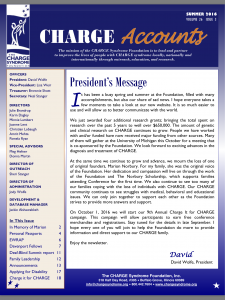 A quarterly newsletter published by the CHARGE Syndrome Foundation primarily for parents of children with CHARGE syndrome. Information should also be helpful to medical and educational professionals working with individuals who have CHARGE. Included with membership in Foundation. A video about the CHARGE Syndrome Foundation and what we do. The American Speech-Language-Hearing Association (ASHA) has developed a CHARGE Syndrome Web Program. This program is accessible through the CHARGE Syndrome Foundation web site. The German CHARGE Syndrome Association has produced a video of young adults who have CHARGE discussing their lives, living with CHARGE, their hopes and dreams. We have CHARGE, so what! from Claudia Junghans on Vimeo. This video provides examples of activities that can be done to improve balance and stability in children who have CHARGE syndrome. By Lauren Lieberman, Ph.D, Pamela Haibach-Beach, Ph.D, Melanie Perreault, Ph.D, Aaron Wood, Jennifer Vanetten, Jenna Sherwood. The Foundation is committed to research into the causes, identification and treatment of CHARGE syndrome. Our Scientific Advisory Board and Research Committee help guide the Board of Directors in all areas of CHARGE related research. Please visit the Research page to read about their work or to learn more about the procedure for submitting a proposal. Current and past research listings are also available on the research page. This issue of the American Journal of Medical Genetics came from the Behavior Strand at the 6th International CHARGE conference. Those papers on behavior are published here along with a few others, and some additional articles on CHARGE syndrome. If you are interested in finding someone in your area please contact the foundation at 800-442-7604 or by sending an email to info@chargesyndrome.org for a list of families. A group of Texas families, friends, and professionals who are dedicated to helping children and young adults who live with Charge syndrome. The CHARGE Syndrome Association of Australasia is a not-for-profit organization committed to improving the health and welfare of children and adults with CHARGE Syndrome. The Association supports families in Australia and New Zealand to enable children and adults with CHARGE Syndrome to reach their full potential. Information by and for parents of children with CHARGE syndrome. This is a non-profit self-help group in support of individuals with CHARGE and their families in German speaking countries (Germany, Austria, Switzerland, etc.). French support group, formed in 1996 by parents. This site is the source of information about CHARGE based in the Netherlands. It is a site by and for parents of children with the syndrome, for schools, professionals and other interested parties. UK family support group that has been in existence since 1987. The links listed below are to help you in your search for more information regarding CHARGE syndrome. Please note that we do not control any of the information you may find on these sites. 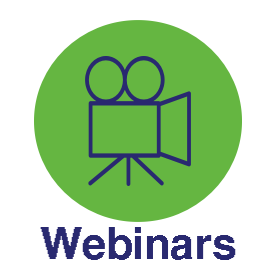 National Consortium on Deaf-Blindness – NCDB works collaboratively with families, federal, state and local agencies to provide technical assistance, information and personnel training. The National Consortium on Deaf-blindness maintains a CHARGE Syndrome section with a variety of articles and both medical and general bibliographies. This organization supports individuals who are deafblind and their families. Perkins – located in Watertown, Massachusetts, the school provides services to students from birth to 22 years of age who have visual impairments or those who are deafblind. Web resources listing about deafblindness. A special public school in the continuum of statewide placements for students who have a visual impairment. It is also a statewide resource to parents of these children and professionals who serve them. Students, ages 6 through 21, who are blind, deafblind, or visually impaired, including those with additional disabilities, are eligible for consideration for services at TSBVI. UK based group that is the leading national charity that supports and campaigns for children and adults who are deafblind. The CHARGE Lab at Central Michigan University undertakes a variety of research projects relating to CHARGE and behavior. Research and Awareness Lab for CHARGE Syndrome at Mississippi State University. Mission to improve the lives of individuals with CHARGE. The CHARGE Center at Cincinnati Children’s is a center designed to help families negotiate both the medical and developmental challenges associated with this condition. A nurse coordinator will work with you and a team of specialists will review your son or daughter’s records and work with your family on a plan of action. Foundation providing support and information relating to tube-feeding. Resources for vision loss, vision-impairment, blindness, low vision aids and low vision rehabilitation services. Non-profit organization dedicated to preserving vision and to providing critically needed vision and rehabilitation services to help people of all ages overcome the challenges of vision loss. National Joint Committee for the Communication Needs of Persons with Severe Disabilities – The purpose of the NJC is to promote research, demonstration, and educational efforts, including both in-service and preservice, directed to helping persons with severe disabilities communicate effectively. Exceptional Parent Magazine – Magazine designed for families who have a child with a disability. A project funded by Perkins that is dedicated to helping parents of young children with vision impairments as well as children with multiple disabilities. An organization based out of Cincinnati, Ohio that engineers and builds devices for people with disabilities to enhance their lives at no cost to them. CheckRare is a rare disease and advocacy website for health care professionals, patients, and caregivers. They focus on rare diseases, new and emerging therapies, clinical trials, diagnostics, and the companies behind them.